What do you think about K2 Mod X? If your reading this, the ski is like 15 yrs old and still gives me perma grinn on the corduroy/groomers and hard pack. This is a great old school all groomers and speedy ski. Light, fast and responsive. I haven't skied in pow, as I have 88 underfoot for that. Old ski I just can't let go of. Riding style: Piste and up to 6" of pow, a homerun for the $ if in good shape. I paid $40 mounted in 2016, just skied 19k vert in just over 2 hrs yesterday! A FANTASTIC (!) Ski !! 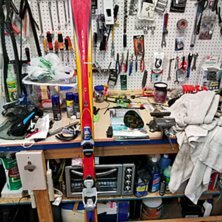 If you're serious skier - who puts big demands on his "workplace" - extreme performance: there's no better than K2's Mod X Pro! Among other things, Lasse Kjuus tried the K2s: "Had I had to take my own money, I had bought these!" Have you read the reviews in SKI and SKIING: "Ski of the Year"! K2 Mod X Pro should be a matter of course and a must for all AMEs who take themselves seriously !! By the way - Someone here at Freeride says K2 Mod X Pro is "lifeless"? Probably it's the "seafarer" who needs CPR !! Keeps with the previous speaker. Hired these for 3 days January 2001 when my tired legs did not hurry with the telisians anymore. I felt safe on all surfaces, and I tried most but clean ice because there was no one where I was. Had a shotgun in the offpiste even though it was windpacked and tended to crowd. Had a 5th if it was not for the silly LED that flashes when you go. What skis! They worked everywhere. The offpiste was of course the best foundation (did not matter if it was junkyard), especially beautiful fluffy deep snow. But, the biggest surprise came when you were going home for 17 o'clock. As usual, the slopes were totally raised and everywhere puckles were formed. While "normal" riders wandered around and regretted, I could stand on like never before! These layers really drive over everything! Should it be a bit too big a hump to drive straight over, you just pushed the edges and swung around easily. Without losing any speed. They also worked very well on manchester, in deep carvings. I can without hesitation recommend these skis to anyone who has been in a while, master most of the basics and like speed. They are worth every buckle. If there is anything you should complain about, then you may have to get caught on clean ice. But these skis are not built for Swedish ice skates, so why complain? If you belong to the heavier range of skiers (type 80+) then choose the stiffer Mod Mod Pro model. Now it's only a little over 4 weeks until you get on your K2 Mod X again. Fy the phase how fun it will be!